Can't Wait for Finding Dory? Finding Nemo was a great movie. It's sequel is set to release in 2015. That's more than a year from now. 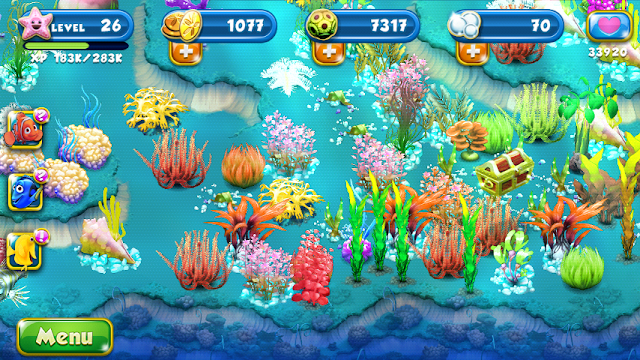 Just in case you couldn't wait for a new piece of Nemo maybe you can try the smartphone app Nemo's Reef. I loved the first movie and I was addicted to this game. Before downloading the app I found it hard to believe a smartphone was able to pull off a good app representation of a Finding Nemo world. I've been looking for a great fish live wallpaper with no success. The app is brought to you by the developers at Disney. 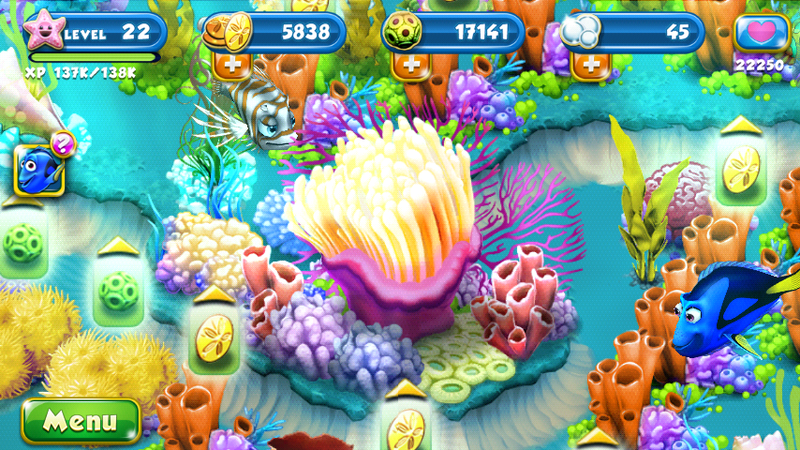 Create and enjoy the sight of a beautiful coral reef around Nemo's home, the sea anemone. 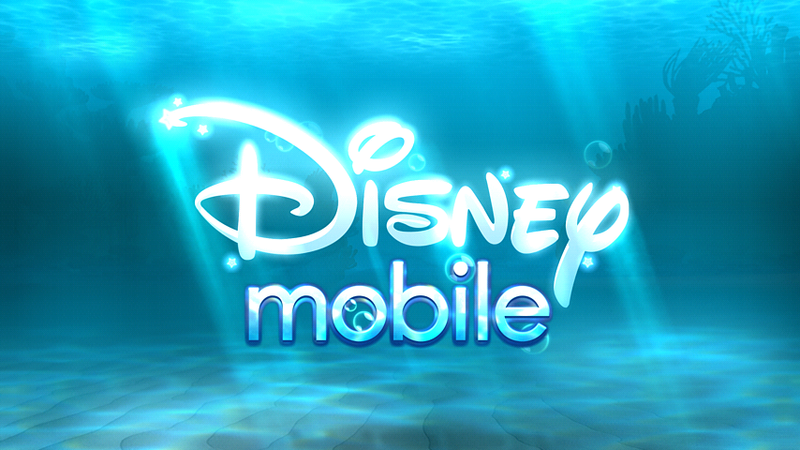 Beloved characters from the memorable Disney movie returns in this smartphone application. Nemo, Dory, Marlin, Bloat, Bubbles, Peach, Jacques, Gurgle, Deb/Flo, and Gills join your reef. Jacgues joins at level 23, along with an expansion to your reef. Bruce, the great white shark, also makes an appearance, but doesn't exactly fit in with everyone else so his stay/visit is temporary. Aww I know. Unfortunately there isn't voice acting in the app so you won't be hearing the voice talents of Ellen DeGeneres and so forth. However, that probably keeps the apps size down. Mr. Ray has been teaching his class about coral reefs. Nemo and a classmate, Tad, are competing against each other with their reef building knowledge and skills. Build a reef using the currency of sand dollars (SD). Objects that need to grow to the next stage need to consume Algae. You must purchase an object from the Nursery using sand dollars and place it on the reef. The reef is like a grid. You will not be able to place objects on a red area while placing objects, only on the green slots. Objects take up one space or four or six spaces(slots) on the reef. If an object shall need algae to grow, it will have 3 stages of growth. The stage it is currently on will be displayed. Each plant has its own time it needs to grow for each stage. All the stages take the same amount of time for the same plant and are displayed towards the top of their icons in the nursery. The game is fun at the beginning, until about stage 13 then it slows down for a few levels. Quests are harder and don't help you get through your levels as much as they did in lower levels. Expect to grind a lot after that. Around level 20 I pretty much had the same set up until recently at level 33 or 34. Level 40 is the maximum level, although the game doesn't actually end. You can just keep playing. Maybe even finally plant the reef and make it look the way you want it to look, not just for money or algae or quests, rare fishes, or experience. It will take forever to reach that level. I have had long periods of days where I would check the game 4-8 times a day for experience and I'm still under level 36. I had and used lots of spread out free time on my hands to consistently check into the app. My only real tip/hint/clue: Don't collect until day 5. Collecting on days before will restart the counter to day 1. 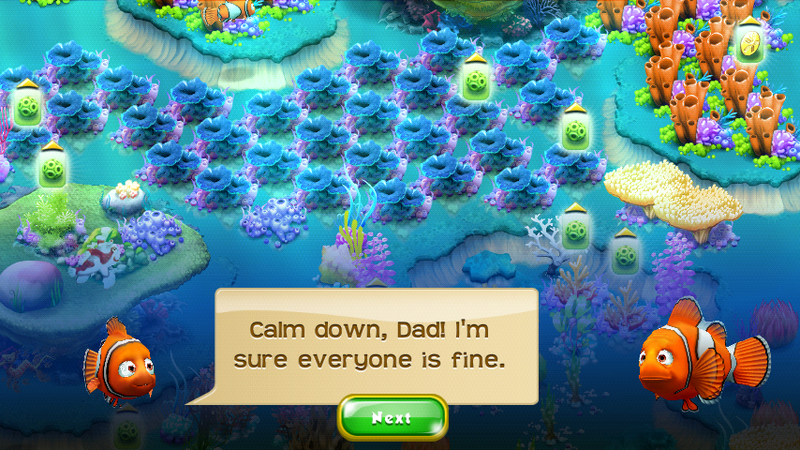 What's the Most useful place for information and strategies for Nemo's Reef? That site is extremely helpful and important if you want to play efficiently. I've visited that site over 100 times (due to my poor memory) to check up on combinations and tips to ensure I was playing the best way possible. If you have questions look it up in forums on that site and the question or problem has most likely been asked and answered by the helpful community. It's the wikia/wiki/ for Nemo's Reef. The Useful Tips page does a great job of explaining and is going to be more help than this page. Although it was written before the March updates, the updates don't change the gameplay, they only speed up and add onto the current game experience. I agreed with their plant and coral recommendations except I preferred more Maroon Pipes than Orange Tube Pipes because of the higher output of every 4 hours and long periods of not playing. I would had been so lost without that site, especially when looking up combinations to attract quests. You'll soon you'll be wondering when do I get who from the movie? Well here's the answer. A great feature the game has is that in the "collections" section you get to view the 3D models and descriptions of the character. This is similar to Jiminy Criket's journal in the Kingdom Hearts game(another Disney involved game). Actually the whole Android apps capability to run smooth 3D rendering on weaker devices seems to me to be similar to what Kingdom Hearts did on the outdated Sony Playstation 2 gaming console. Rare fishes don't have character descriptions but they do contain details as to how long it would and still needs to complete a pearl from being fed and how much it needs to be fed to produce a pearl. Of course at low levels there was no escaping from constantly tapping. I build batches of yellow table plants and fan coral. When you level up, you don't have to rush planting the newly available plants unless you want to use them because during that level it will most likely become a mission and you will have to plant another one anyways. Once you get Orange Tube Sponge and Blue Mushroom then build batches of those plants without removing your Yellow Table Plants and fan coral. Those produce the most of their products per second of gameplay and will still be handy/useful if you plan to keep playing the app. Very much later into the game Maroon Pipe Sponge,Yellow Small Grass, and Eggshell coral will become important. I started a small batch of Eggshell Coral but soon went on to replace the all fan coral with the Eggshell Coral one by one as they required the same amount of time to produce but instead got 30 algae per hour instead of 10. I started with a batch of Maroon Pipe Sponge but slowly replaced the Orange Tube Plants with the Maroons. Note:Orange Tube's produced more exp than Maroon 5's but less gold every 2 hours. I believe it was 10 SD's vs. 20 SD's. I never replaced all of my Orange Tube Plants as they were very efficient for experience points. I only planted a few Psychedelic Coral until I quit playing the game. A general rule or trend of the game was that the plants that produced the most per second while on the game had the lowest maximum capacity of holding those produce for you to collect. The plants that produced very slowly could hold onto the most for you to collect whenever you came back to the game. Note that most plants produce experience points too, but a few plants don't. These plants will produce more of that product than usual. For example, the Tentacle Coral, Orange Barrel Sponge, and Pink Sponge Bed. The ones I just mentioned were very high level plants and I did keep a few of them on my reef as later in the game I became impatient and greedy and switched my focus from xp towards money and green. At levels after 25 I also played less per day so the slower plants were more useful of my time (and battery life). Characters remain true to themselves in this app. One possible tip is to avoid gaining maximum experience at first because it only helps a little to gain levels. I said possible because the effectiveness of Vitatilty is very doubtful. Before you level up be sure you have already met the minimum requirements in the categories located in the heart icon. The higher levels require you to have more of the corresponding items to add to its %. The higher the percentage of each section (100 maximum), the higher your chances of getting a rare fish are(according to the game). After leveling too fast I was never able to get pass 90% on the Rare fish category. I haven't really looked into the percentages besides testing and trying to gain 100% for the current level. According to the % rule mentioned, it should be easier to get rare fish the higher your percentage, however when I finally achieved 100% for 3 of the 4 categories, it never got any easier to obtain a rare plant. Most of the time 1/2 or 1/4 of the mystery seeds will be rare. It was highly uncommon to take more than 4 mystery seeds to get a rare plant. My theory about Vitality seems to be supported by a few in a GameDreams forum here. If one of your objectives is to grow a rare plant, I found it that the chances were lower than usual when those objectives were active. After a while (sorry forgot the level) mystery seeds lose their oomph and Enigmatic Seeds take the role the mystery seed once had at lower levels with the same probabilities. However they cost a lot more, 10,000 SD's. Glitch: while placing a mystery seed at an edge next to where there are flat but red squares, that seed may grow into something that occupies that red square. Once you move that object however, the slot becomes red and not usable again. Saturday Challenges. These won't occur every Saturday. So far I know of the grow 8 rare plants in 48 hours. 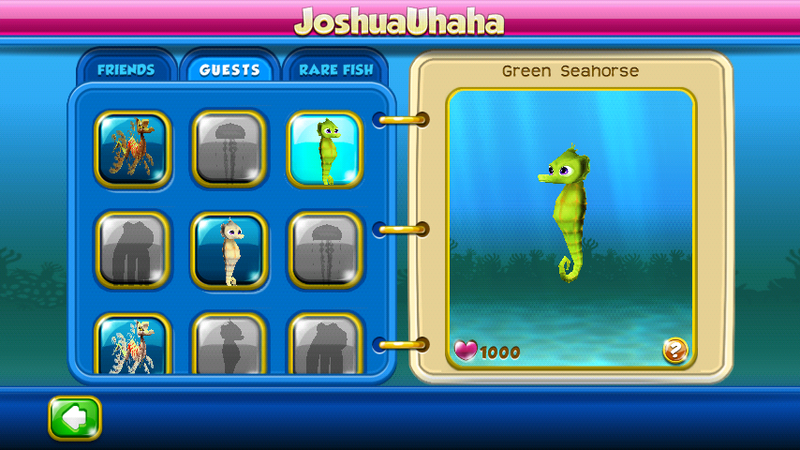 Upon completion you receive a hybrid looking fish. Another Saturday Challenge is find the fishes in your reef (by tapping on corals) because they have been scared of Bruce visiting. He goes away after the challenge. Updates: After the March 2013 updates some things were changed. Previously only the iPhone versions of the app had ads. While playing the game I felt that it was odd that we fed the plants but not the fish (corals aren't plants, they are actually fish but whatever). I'm more used to having to feed fish in a tank than plants. Again it's weird that we didn't feed the fish at all in the reef. 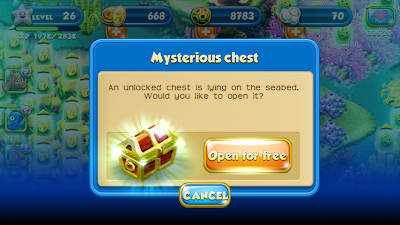 Some users also complain that it was too difficult to obtain pearls through free play(without purchasing with real world money). I personally thought this was just the design of the game as that is common amongst free apps. With this early March update these three things were addressed. You get very few things for Free (or almost free) in life, just open it. -You can now feed the rare fish algae to produce a pearl. Each species has its own rate of producing a pearl, and the amount of algae consumed. To do this, tap the fish and on the bottom right where it usually says "1 peal to finish" instead it will say "feed ___ amount of algae". With a late March update (approximately March 23rd) most likely to their servers, the ads started going away. They probably figured or got too many complaints that the advertisements made the game a lot less playable. An ad would load up just about every time you entered and when you exited the nursery. 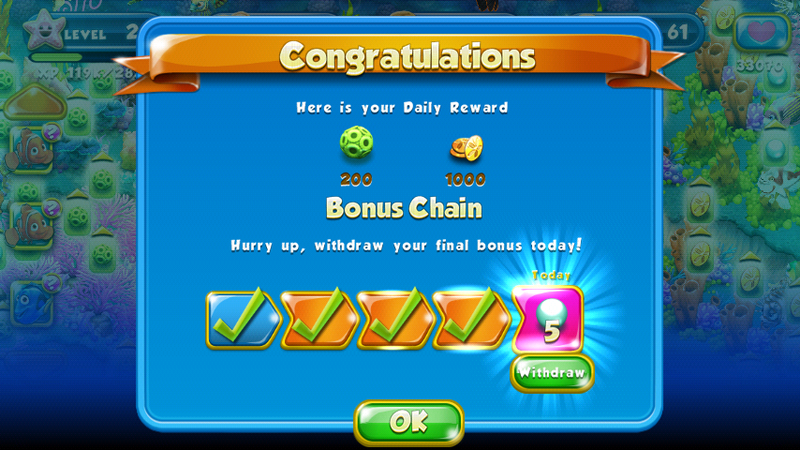 This caused the gameplay to become very annoying and slow to buy a plant(two pop ups per purchase). More explanation into how the Ads were annoying. For my Xperia Play, an ad would load from the internet causing you to have to wait after you have gotten to your destination (your reef upon start up....nursery, back to the reef from the nursery). Normally the app probably used just about every ounce of RAM I had so when an ad loaded it would clear my RAM just enough to have to reload (as long as rerunning/restarting) the app upon closing the ad. So start ups would have to load twice before I could even do anything(start playing). They are gone now but sigh. Luckily I had just about finish my overhaul and remodeling of my reef with cat's paws when the almost unbearable ad inclusions were made. The ad was often for the Toy Story: Smash is app. Funny because when I first clicked the ad in its first days it tried to take me to iTunes on my Android device. After the May update the treasure chests seem to appear less often. This isn't that in my opinion important as experience points become valuable late game. I quit playing some time around the end of May/start of June. After level 30 or so you do not get enough expansions and are only getting the same maximum output while the requirements to level up greatly increase.The smartphone app was repettitive before, but in later stages it felt even more hopeless as I went on. Spoiler and Heartbreak Alert: There is one point in the game where it says for you to use your new expansion(which means you just got one) and you don't get that area expansion. I factory reset my phone due to issues reading my memory card. This lost me my memory and the games progress. However I was able to reach them via a report http://disneyinteractivestudios.custhelp.com/app/answers/detail/a_id/3918 with the necessary information for the report (along with lots of details of what I can recall with help from my occasional screenshots). Four days later I got my original name and game progress back. Thank you Nemo's Reef people. They were extremely helpful and nice and the instructions were simple to follow. This is one exciting game. I haven't tried this app and I am also excited for the sequel of Finding Nemo. Thank you Alexis for your continued support by reading and commenting.